Fame is a strange thing in the age of the internet. Whereas there used to be a time when people had to work hard to be recognized in their field, it seems like influencer culture, reality TV, and 5-year-old YouTube stars are really shifting the paradigm for the way we come to think of famous people. 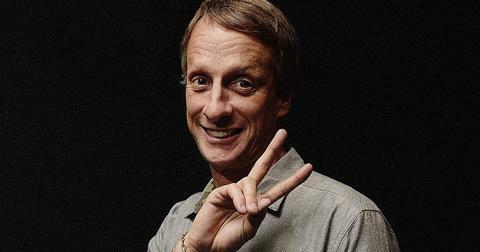 No one personifies this shift more obviously than pro skater Tony Hawk, one of the most successful and influential pioneers of skateboarding as we know it today. The 50-year-old — who was the first skater to successfully land the "900," a trick that involves two and a half mid-air revolutions on a skateboard — isn't just known within the skateboarding community. 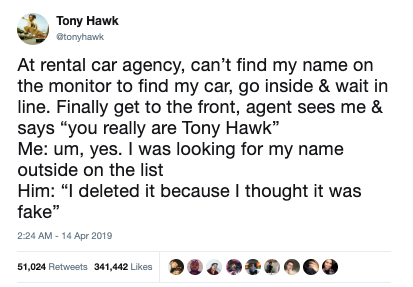 Thanks to Tony Hawk's Pro Skater, his licensed video game series, Tony's been something of a household name since the first of his 18 games debuted in 1999. But his career doesn't even stop there. Tony's appeared in tons of movies, music videos, game shows, and even TV shows like What I Like About You, Last Man Standing, and Sesame Street. In other words, Tony's CV runneth over. But you might not guess that he has an illustrious career in the public eye at all, judging from the way his encounters go in the real world. Thankfully, he shares them all on Twitter so the people who actually recognize him can get a good kick out of his struggles. Most recently, he faced a few issues when trying to rent a car. 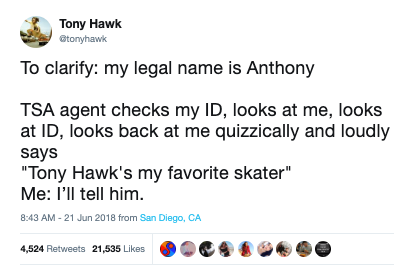 When the only pro skater we can name tried to rent a car, he stood in line for a really long time before it hit him that his name was no longer on the waiting list. 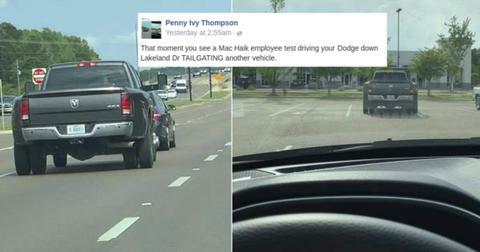 As he tried to figure out an explanation, he learned that his name was deleted because the rental car agent "thought it was fake." Here's hoping Tony was able to skip his way to the front of the line and hopefully ended up nabbing a Maserati for his pain, suffering, and humiliation. But as one would expect, this isn't the first, second, or even fifth time something like this has happened to Tony. 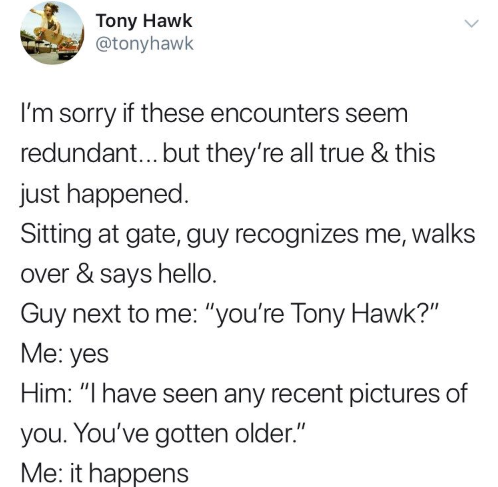 Like the time a TSA agent wondered aloud to Tony's own face what she imagined Tony Hawk is "up to these days." Just imagine being a fly on the wall for these run-ins, or standing right behind Tony with your coat and shoes off, watching this all go down while you try and lift your jaw off the floor. Somehow, these interactions always seem to happen while Tony's in transit. Makes enough sense, we suppose, that the people in his home town of San Diego would be familiar with their celebrity residents. But then there are some conversations Tony tweets that are so dumbfounding, they're practically existential. At the very least, they'll leave you scratching your head. Like this time someone admitted that Tony was their favorite skater and then still didn't realize they were talking to him. 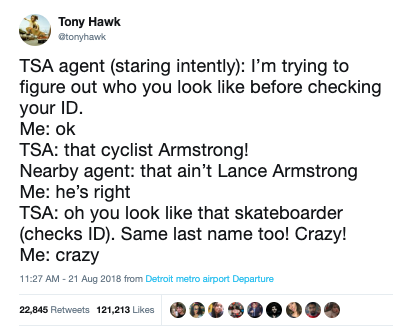 We're starting to think every airport just needs to plaster Tony Hawk's face around the break room so the agents can look out for him in the future. That definitely would have saved this next TSA agent the embarrassment they endured. "I'm trying to figure out who you look like before checking your ID," they said, opening up the floodgates. Then, they almost even got close by placing him in sports. But after unsuccessfully guessing Lance Armstrong, they zeroed in on "that skateboarder." Seriously, how many famous skateboarders at Tony Hawk's level are there? Maybe three? Extra points for this TSA agent still being unable to process the information even after checking Tony's ID. 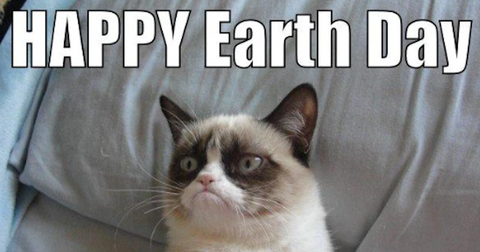 While we empathize with spacing out in the workplace, this has seriously transcended new levels. We love how deadpan Tony's reactions are whenever he types these conversations out. What did he do in a past life to deserve this kind of celebrity torture? 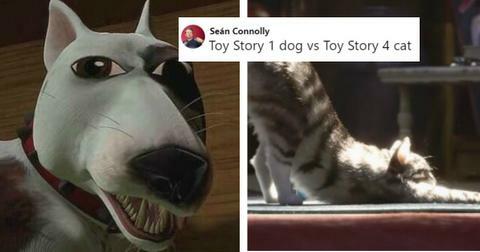 Even the most mundane interactions make us want to laugh-cry. Like the time he was asked by someone at the grocery store in Carlsbad whether he ever gets mistaken for Tony Hawk. 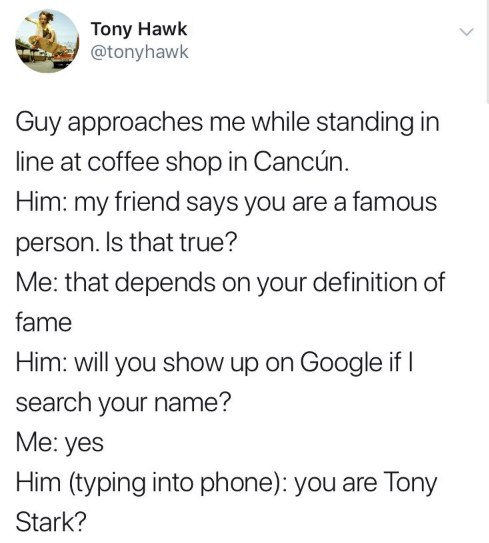 But there are many more like these, and we imagine Tony Hawk has decided only to tweet his most curated and delicious encounters. If you're living for the cringe, we've got you covered. Like the time some guy in Mexico tried to play 20 questions to figure out who he was and then ended up guessing the fictional character of Iron Man himself, Tony Stark. What is up with people these days?! Whatever happened to the tried and true adage that Wittgenstein once coined: "Whereof one cannot speak, thereof one must be silent"? 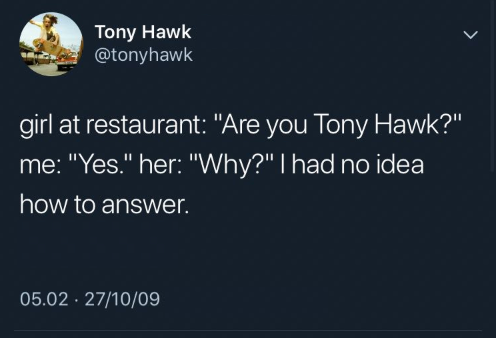 It would have been so much more preferable to say no words than to screw up your one conversation with Tony Hawk so massively. On second thought, we should also bring up every parents' favorite advice to their kids, "If you have nothing nice to say, don't say anything at all." 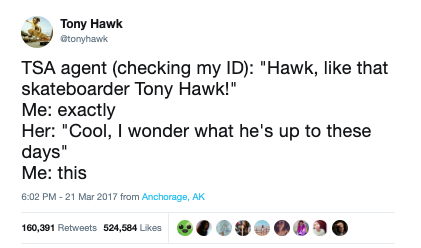 Because somehow the only person who succeeded in accurately placing Tony Hawk couldn't think of anything to say other than thismassive burn. Who raised you, bb? We'd be remiss if we didn't also highlight how utterly adorable Tony is in this tweet. "I'm sorry if these encounters seem redundant," he opens with, and then tells the jerk who's calling him old that "it happens." Boy, do we wish we could just reach into this computer and give Tony a hug. 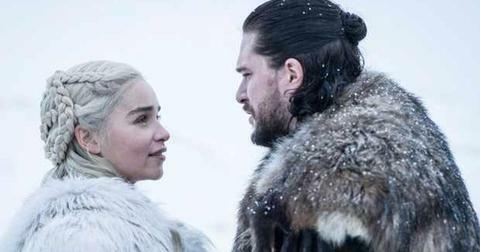 However, none of these cringe-inducing interactions holds a candle to our favorite of them all, which we were strategically saving for last so we could send you out with a bang. 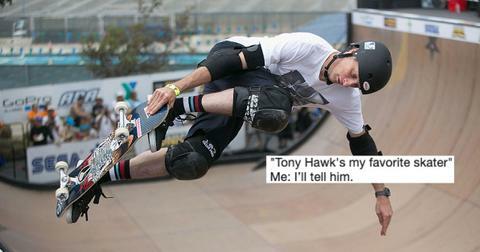 We are just about as blown away with this conversation as Tony Hawk was when this happened back in 2009. Imagine mustering up the guts to interrupt a celebrity mid-meal, first of all — but you do it anyway, because you're feeling on top of the world and like anything is possible today. Then, when you finally go to open your mouth, the only thing your brain can muster is to verify the celebrity's identity. This is a very awkward move that we wouldn't recommend to anyone. But if, on top of doing all that, you just ask the star WHY they are that star... Well then, my friend, you end up blowing so many minds we don't even know what to do with you in this world.